This web-user gave a score of 4 / 5 to Vacances Bleues on august 2018, but declined to leave a comment. This web-user gave a score of 5 / 5 to Vacances Bleues on august 2018, but declined to leave a comment. 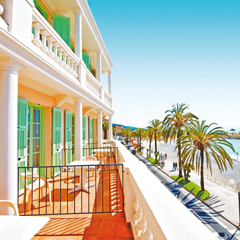 Hotel Balmoral in Menton had a great location and a nice view to the sea. The rest was nothing to brag about. The room was old and poorly maintained, dark and warm. There was ants in the room. Most of the staff could not speak english and all information was in french. We are not coming back. If you want to live by the sea this is the best place. This web-user gave a score of 5 / 5 to Vacances Bleues on july 2018, but declined to leave a comment. Great staff, great location, rooms need a little updating but always well cleaned and air con in room mentioned you got a good night's sleep. Would definitely stay there again. This web-user gave a score of 3 / 5 to Vacances Bleues on july 2018, but declined to leave a comment.